San Diego CA (Sept 10)--The internet is just a little more peaceful today, 5 days after the capture and arrest of felon fugitive Debbie Frisch on Wednesday afternoon. Miss Debbie is being held the Las Colinas Detention Facility in Santee, CA. 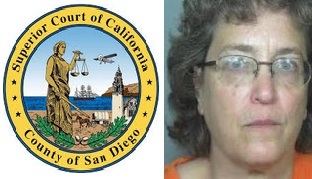 She faces a San Diego Superior Court judge today at 1:30PM PST. The topic on teh docket is, no doubt, Debbie's extradition to Colorado to face justice on her latest felony charge(s?) --and, on October 2nd, sentencing on older felony charges. Upon news of her arrest, The Other McCain sent out a plea to various Colorado criminal justice officials (culled from Debbie's idiotic idea to CC her criminal emails to EVERYONE) reminding them that they were "witnesses to how seriously deranged [Frisch] is, and how unlikely it is that she will ever be able to live peaceably in society. Let us hope that the courts will do the right thing, and put her away for a long, long time." Yes, indeedy! Teh Squeak thanks Rick T. and John W.L. for comments updating Miss Debbie's arrest and first court appearance Friday. Well, she will be cooling her heels for another month, Deb's not due back in court until 10/11/18.